We return from our antipodean adventures with a number of developments in the silent film world to tell you about, the first of which is British Pathé’s new website. The company that now bears the name British Pathé has little connection with the original Pathé firm – the Pathé newsreel library in Britain was purchased by some venture capitalists a few years ago, but they have worked hard to raise the profile of the collection. This has included a high profile for Pathé clips on BBC television following a special footage deal, and the recent BBC4 television series on the history of the Pathé library. British Pathé has also made energetic use of social media, blogging and tweeting with the best of them in a commendable effort to engage an online audience with archive film. This has now led to a re-designed website in which blog, Twitter feed and Facebook presence (6,634 people like them) are prominent on the front page alongside thematic selections of newsreel and cinemagazine footage. The British Pathé library amounts to some 3,500 hours (90,000 clips) ranging from the 1890s to the 1970s, and following a Lottery-funded grant in the early 2000s the whole collection was digitised and has been made freely available (in low resolution) to all ever since. We have written about the non-fiction and (surprisingly enough) fiction films to be found on the Pathé site before now. What is new about ths site which is of particular interest to us is a timeline feature, which enables the researcher to select any time period, from one year to another by the use of a simple slider tool, making it easy to identify film from whichever part of the silent era interests us. The timeline tool doesn’t appear on the front page, but if you put in any search term, or simply click on ‘Search’ without having entered any term at all, you are taken to the search results page and the timeline appears. 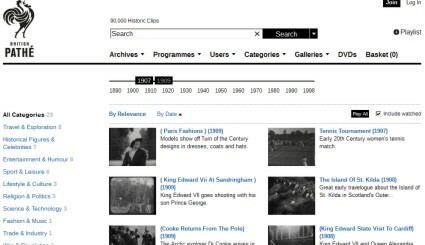 Use this to select the period 1890-1930, and you’ll find 16,875 relevant clips waiting for you. Alternatively, search for everything, then go to the Advanced Filters option on the right-hand side and select Videos with No Sound (there are 41,092 of them). A warning or two is required when using the British Pathé site. The newsreel collection is reasonably well documented from 1918 onwards, but before then the collection is a mishmash of Pathé newsreels, bought-in footage, fiction films, unidentified material and all maner of oddities. A lot of it is not Pathé-produced (there are Lumière, Méliès, Hepworth, Eclair, Eclipse and other productions to be found). Many of these early items have only approximate dates and made-up titles, and often the catalogue records are more enthusiastic than historically informed. This can make Pathé an annoying site to browse, since they seem to know so little about such a significant corner of their collection, but it also provides the potential for some interesting discoveries for the knowledgeable researcher, because there is a lot there that is crying out for proper identification and appreciation. It can be difficult finding some of the undated films, since they won’t turn up by using timeline searches, but if you can find just the one fiction film and then search on its keywords, such as comedy or melodrama, then you’ll uncover more of these hidden fiction films. For non-fiction and standard newsreels of the silent era, the British Pathé site is a joy. There is every personality, incident, location, fad, issue, fashion, talking point, invention and innovation you could wish for, from 1896-1930. With the timeline, categories and keywords, the British Pathé site has become all the more compulsively browsable, even if one could wish for a little less in the way of vague speculation among some of the catalogue records. I love the Motor Skater…..the (I assume) address above the shop window says Sandgate – who would be filming in the Folkestone area in the 1903-6 era ??? Hush Don’t Wake the Bobby is filmed on the rue Botzaris by the Parc des Buttes Chaumont. Nearby Gaumont made many films in this place, and I would guess that this is another of them. Thank you both. I wish I knew who might have been fiming in Sandgate around that time, but I don’t. I’ll have to ask Frank Gray at Screen Archive South East (or might you be reading this anyway, Frank?). It’s interesting that there are non-Pathe French fiction films in the collection – they come from what used to be known as the Pathe Old Negatives collection, a treasure trove of early stuff largely undated and unidentified, and all digitised alongside the standard newsreel stuff. I’m tempted to produce a listing of all the fiction film to be found on the British Pathe site and see if we can’t identify some of them.